Dennis Morris moved to Britain from Jamaica in the early 1960s and began taking photographs from the age of eight. His personal photographs of British Caribbean community life in Hackney came to form the series Growing Up Black. A central part of community life photographed by Morris is the church. Shiloh Pentecostal Church on Ashwin Street in Dalston was, Morris said, ‘the first church owned by the local black community. It was custom for young and old to dress in their best clothes for the Sunday services.’ The church services documented by Morris convey the major role religion played in the lives of many British Caribbean people. The church is also shown as a space where new communities and traditions were forged. The V&A acquired ten photographs by Dennis Morris as part of the Staying Power project. Staying Power is a five year partnership between the V&A and Black Cultural Archives. 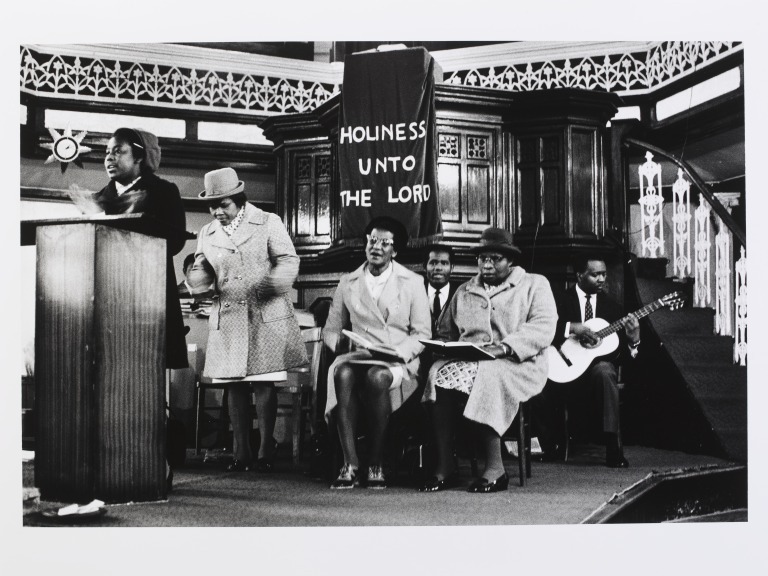 The project aims to explore black British experience from the 1950s to the 1990s through photographs acquired by the V&A and oral histories conducted by Black Cultural Archives. 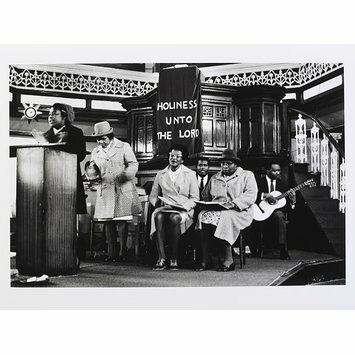 Black and white photograph of women and men on stage in a church. One woman stands at a lectern clapping her hands. Behind her is a row of three women in coats; one of them is stood up, blurred from movement, and the other two seated each holding a book. At the back two men can be seen, one playing a guitar. A fabric banner hanging from a higher lectern behind the crowd has the words 'Holiness Unto the Lord' stitched on it.